The Main Barn: 10 permanent box stalls that are 11.5ft x 14.5ft. The Indoor Arena: (60ft x 100ft) which also houses the stalls of the Main Barn as well as an additional 8 covered pens (10ft x 12ft). On the outer perimeter of the Main Barn we also have 10 uncovered pony pens (8ft x 10 ft). 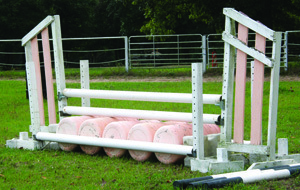 The Outdoor Arena: (140ft x 260ft) This arena is large and provides ample space for schooling and jumping. Pony Arena: (60ft x 72ft) This small arena is perfect for a smaller working space for those little ones that need a closer watch. In addition to our arenas, we have a designated jumping field as well acreage that includes several cross-country jumps including a ditch and bank. There are 4 outside runs of approx. half an acre as well as additional pasture including a pond. We have 3 uncovered wash racks and 1 large covered wash rack in the Main Barn. Guest rest rooms, refrigerator and microwave. 3 Tack Rooms (1 designated for boarders only). There is ample space for trailer parking and 18 wheelers.